The first step towards your business success in the online environment starts with choosing a site that is representative of your site. 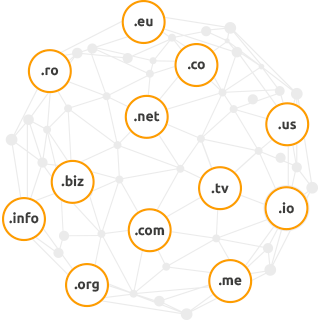 Register your domain with us on .ro, .com, .eu and many other TLDs. In addition, at Net Solution Hosting, we help you develop your site and provide constant monitoring to ensure that once you have a hosting package, your domain will always be available for access. Do you want to know if the domain name you want for your site is available? Nothing easier. Use the search function below. Why register your domain from us? Because we have an experience in the field of over 15 years and the quality of the services offered to our customers who have not only the possibility of registering a domain, but also a lot of other web services options, which guarantees the good functioning and safety of your domain. Our domain registration services offer a high level of data protection. Every new domain registered through Net Solution comes with a number of benefits. They provide control and accessibility to your domain, as well as advantages to help you grow your site and, implicitly, your presence or your business online. How do you acquire a domain? Choose a short, easy to write and pronounce domain name. Choose the extension based on your ongoing activity. Go to the search field (above) and check if the name you have chosen is available. Once you've found the perfect field, add it to your cart and click on "Order completion". Follow the steps to complete the order. Do not hesitate to contact us if you are have any difficulties.